A distended stomach, commonly referred to as bloating, is often caused by gas. Though the condition is uncomfortable, it normally goes away within a few hours. Children frequently develop a loose stool and diarrhea along with bloating when they overeat, suffer from minor illnesses, or have food sensitivities. In most cases, the bloating and diarrhea are not caused by serious underlying conditions. However, if a child repeatedly develops these symptoms or if the symptoms don't go away on their own, she may have a serious illness. Consult a doctor for more information. Pediatrician Dr. William Sears, M.D. explains that food allergies typically provoke an immediate reaction and don't typically cause stomach problems. Food sensitivities, however, cause stomach problems several hours or days after a child eats the offending food. The gastrointestinal irritation might cause bloating or gas, leading to a distended stomach. If your child frequently develops symptoms, begin keeping a food log. Carefully monitor what your child eats and whether and when she gets sick. Some babies are lactose or soy intolerant, so baby formula may be the culprit. Ask your pediatrician about a formula that won't upset your child's stomach. If you are breastfeeding, something you ate and then passed along in your breast milk may have caused symptoms. When a child eats more than his stomach can comfortably hold, his abdomen might grow distended and he may develop diarrhea as his body attempts to eliminate the excess food. Encourage your child to eat slowly so he has a chance to feel full. Don't serve sugary snacks and sweetened juices and sodas. Sears explains that sugary and processed foods can have serious negative effects on a child's digestive system. Children who eat lots of sweets and processed foods may develop diarrhea, gas, bloating and nausea. Encourage your child to eat fruit, vegetables and nuts as a snack and give her water instead of soda or juice. Stomach viruses frequently cause diarrhea and bloating, according to the American Academy of Pediatrics. Children's stomach lining may be irritated by a virus or bacteria, resulting in swelling. Give your child lots of water to keep her hydrated and call your pediatrician. Occasionally, the common cold, sinus infections and other ailments cause stomach problems as the infection moves to the stomach. Rarely, serious diseases such as gallstones, pancreatitis, appendicitis and liver disease cause the stomach to swell. Children may also develop diarrhea. If your child has severe pain around her belly button that then moves to her lower right side, she may have appendicitis, according to the U.S. National Library of Medicine. If a distended stomach and diarrhea last more than a day, ask your pediatrician to examine your child and test her for serious illnesses. 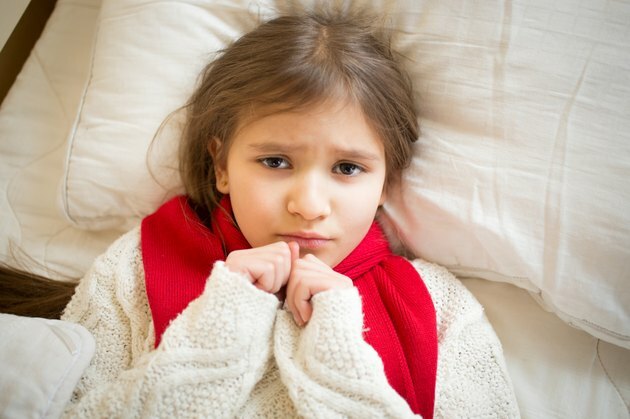 What Are the Causes of a Constant Stomach Ache and Fatigue in Child ?